Curiosity, and a desire to figure out how things work. 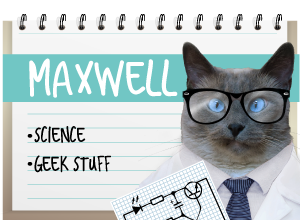 To this day, Maxwell will periodically jump up onto the bookcase where the Newton's Cradle is stored...and the "clack-clack-clack" of balls being struck is heard throughout the house as he starts it up again. Clever kitties that was well funny. Have a super clack clack Sunday. You guys are too smart. Careful, your humans might want you to get jobs as an Engineer and support them!! You let us know when they start deriving equations for periodic movement, cos we'll know the Cat Takeover has begun! Allie just overheard Maxwell muttering about elastic collisions, exchange velocities and conservation of kinetic energy. She wants to know if she should start worrying...? Allie: *giggle! * And we girls are surrounded by them over here! You should really get a PINK one for Allie! 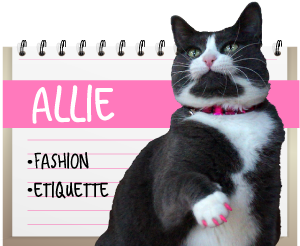 Allie: EVERYthing looks better in pink, don't you think? Austin: Errr I have basic issues with Newtons law of gravitation! He didn't take into account the maggot in the apple! Bet you guys never thought of that, huh? Staff: That's a bit rich coming from someone who couldn't even get to grips with Fermat's first theorem !!! 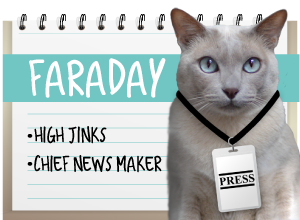 FaRADaY: *waves paws madly* WAAAAAAIT. Daddy sez a feather & a brick'll land at the same time. So it doesn't MATTER Maxie! Absolutely brilliat feat of engineering expertise for Maxwell & Faraday to have discovered what makes the balls clack! Oh,that looks like a fun toy! My human remembers those from when she was a kid. Where do I get my paws on a GIANT one of those. You know, big enough that I can take out a certain orange kitten??? I have to agree with Allie though. Unless I'm using it for tactical assault purposes, I'm not interested in a plain black one. I must have pink. OH WOW! What if there was a HUGE version of that hung from the ceiling? It might keep going for a day until the Beins started it again... We could paw at it FOREVER! Those are some pretty smart kitties. We wondered if anyone ever said, "curiosity killed the engineer"? Hey! Wes usded to has one of those!!! Me used to loves to play with it, especially in the middle of the night....me wonders where it is! PS - the Mom here, she saw those guys playing with it the video and tried to whap it! Nells, did you really? you GO girl! Go to the head of the class! Heh heh. You were already brilliant as kittens, guys! WOW! Clever boys! LP's father was an engineer and her brother is an engineer too (nuclear). LP, really? One of our dad's degrees is in nuclear engineering! totally brilliant, and I am sure it makes you smile every time. Oh that is such a darling video! Kitties you are so cute! Brought us smiles, thanks!